This September, Vision Directors attended a special and unique fundraising event in support of Royal Manchester Children’s Hospital compliments of our customer I J Parkash Ltd. 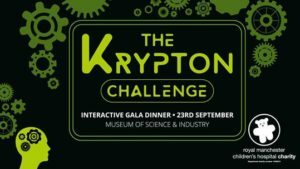 The Krypton Challenge was a gala dinner with a difference with TV legend Gordon Burns hosting the night at the Museum of Science and Industry & based on the game show the Krypton Factor, the event combined quiz, puzzle, and physical challenges testing contestant’s stamina and mental attributes. Teams went head to head in rounds & activities hosted by Gordon Burns and team members skills were put to the test live in front of an audience! It was a great night & most importantly helped raise lots of money to make a difference to poorly children in hospital.